My husband’s favorite Friday night soup tied for runner-up in the Better than Your Bubby's national recipe chicken soup contest, which was written about in the New York Times in March 2009. (You can read more about it here: http://cityroom.blogs.nytimes.com/2009/03/12/soups-on-and-its-not-your-grandmothers/, or http://www.nytimes.com/2009/03/13/nyregion/13soup.html, or http://jstandard.com/index.php/content/item/outreach_group_soups_up_shabbat/7316). The second best thing about this soup is that it’s an easy fix. There are only a couple of steps, one of which is throwing all the ingredients together and forgetting all about it for a couple of hours. And the absolute best thing about the recipe is that it is completely delicious and impossible to mess up. You can add or take away the heat based on your family’s spicy/sweet preferences. Combine all ingredients except for the noodles and fresh chives in a large pot with water above the contents by at least one inch. Bring to boil, then reduce heat and simmer for approximately two hours, with at least the first hour without a lid on the pot. Remove the chicken parts with a slotted spoon and debone then, returning choice bits to the soup. Remove carrots and slice, returning them to the soup. Remove the other vegetables and either discard, or slice and return to the soup, depending on your preference. Taste the soup and correct seasoning if necessary (if you want more sweetness, add paprika, more spicy, add another pinch of cayenne). 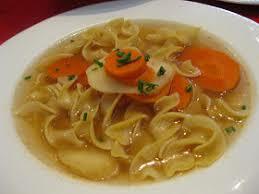 Add uncooked noodles to the simmering soup as late as possible before serving (at least a half hour). Garnish with chopped chives. Serves six, with enough for seconds. Just printed out this recipe! Am trying this out for (erev) Yom Kippur!